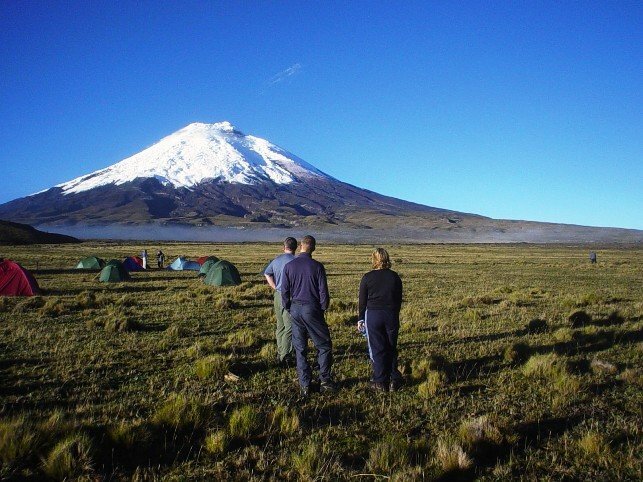 This 6-Day trekkers delight crosses stunning grasslands dotted with volcanoes in the highlands of Ecuador. Each day will be spent trekking in the open high altitude plains until the final ascent up Cotopaxi volcano. 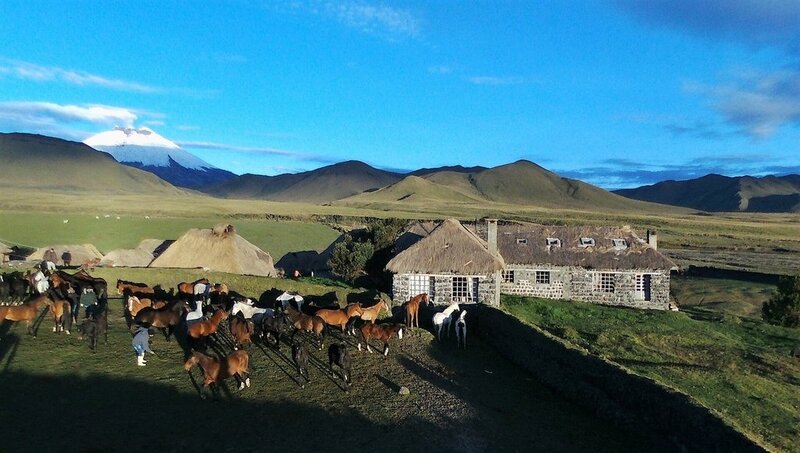 Along the way, we'll spot wildlife, meet Andean cowboys, sleep in tents and overnight in comfortable haciendas. Hiking to an elevation of 15,744 ft on the side of Cotopaxi volcano. This 6-Day itinerary is perfect for hikers looking for a high-altitude challenge. The walk doesn't require technical experience and most of it is over flatlands in the high desert. It does require stamina as you'll be walking full days end-on-end at high altitudes. On average, you will walk about 12 miles per day. 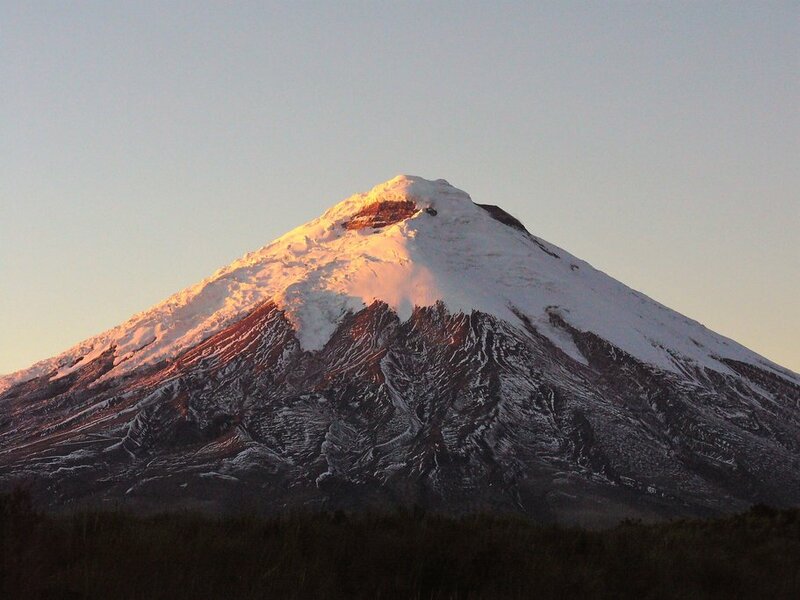 The reward for your efforts is stunning views of the volcanoes that erupt from the Ecuadorian landscape. 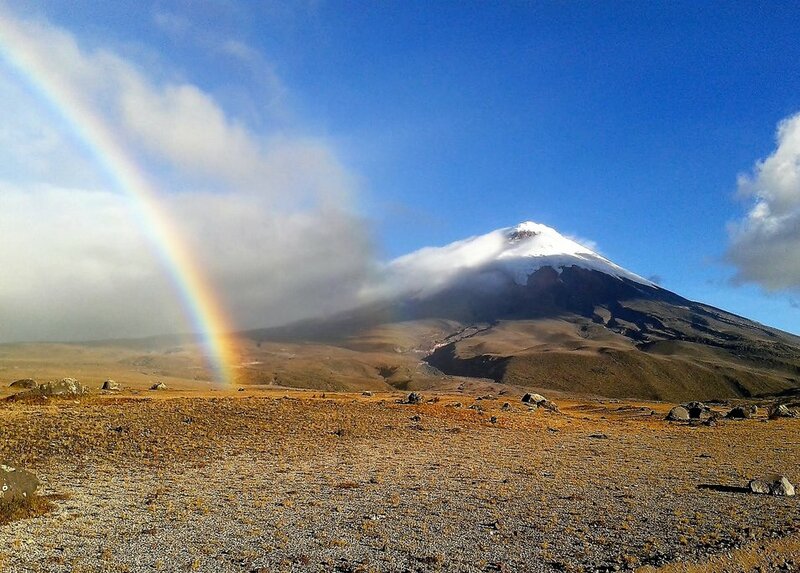 The journey culminates with a hike to the climbers' refuge on the side of Cotopaxi volcano. Two nights are spent tent camping on the open plains while other nights will be spent in cozy haciendas. 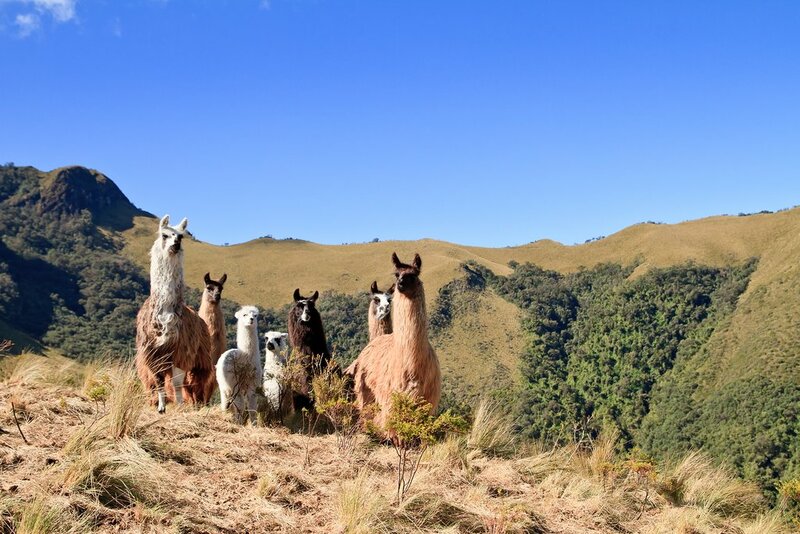 Llamas congregating on the slopes of Pasochoa, an extint vocano. You will be picked up at your hotel in Quito by a driver and guide and taken to Hacienda El Porvenir, located in the foothills of Mt. Rumiñahui. 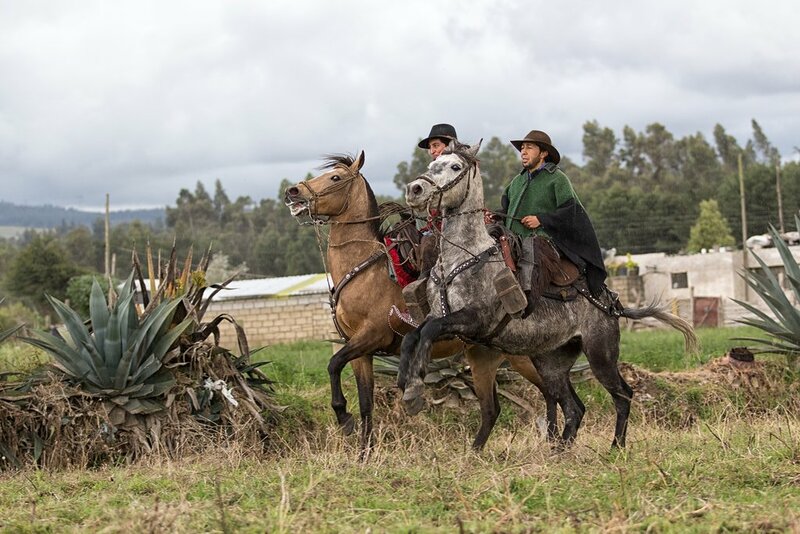 Following a hot drink of mildly-alcoholic canelazo (made with cinnamon and aguardiente), you will be driven across the páramo (high grasslands) to Pasochoa Reserve. From here we hike in Hacienda Santa Rita private reserve, at a starting elevation of 10,826 ft (3300 m). Our hike goes in the direction of Mt. Pasochoa, an extinct volcano. The route crosses areas of native Andean forest and páramo. We will trek through fields covered with high straw and enjoy the magnificent views of snow-covered mountains, including Antisana, Cayambe, Cotopaxi and Sincholagua. A box lunch is available. After a 7-hour round-trip hike, we return to Hacienda El Porvenir for a hot meal. Our campsite in full view of Cotopaxi volcano. After a filling, farmhouse breakfast we walk in the direction of Cotopaxi National Park, reaching the entrance after 4 km. In the park, we'll visit Pucará del Salitre, an old Inca fortress, and then continue east on Inca paths to reach our camping spot for the night. The total walk of 12 miles takes about six hours, over mostly flat terrain, at an elevation of 3700 m. We'll have excellent views of Cotopaxi volcano every step of the way. Camping tonight is tents. Hacienda El Tambo, an old mountain refuge built with Inca stones. 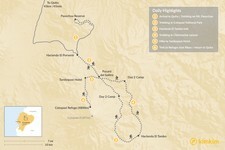 Today’s walk takes us to Hacienda El Tambo, on the eastern flanks of the Andes. The walk to the hacienda crosses hills and valleys in the shadow of Quilindaña, a peak that resembles the Matterhorn when viewed from the Italian side. The average altitude of our walk is 3800 m, with the walk cresting at 4200 m on one mountain pass. Our walk lasts 7 hours and is mostly on flat land. By the end of the day, we will have covered 20 miles since the start of our trek. 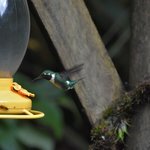 Tonight we sleep at Hacienda El Tambo, an old mountain refuge converted into a lodge. Local chargas (cowboys) will accompany us on our walk through cattle country. Our walk today takes us across the Chirimachai Canyon. The climate here from the eastern jungle rises to meet the central Andean valley. Glaciers from Cotopaxi supply water to the land, creating a stunning green landscape. We will be accompanied on this walk by local chargas (cowboys), as we pass through their cattle country. The hike takes 6-7 hours, covering 14 miles and the average altitude is 3850 m. Our next campsite is located at an elevation of 4000 m.
We head west today from our campsite and reach an accessible flat path overlooking glacial valleys and stunning panoramic views. 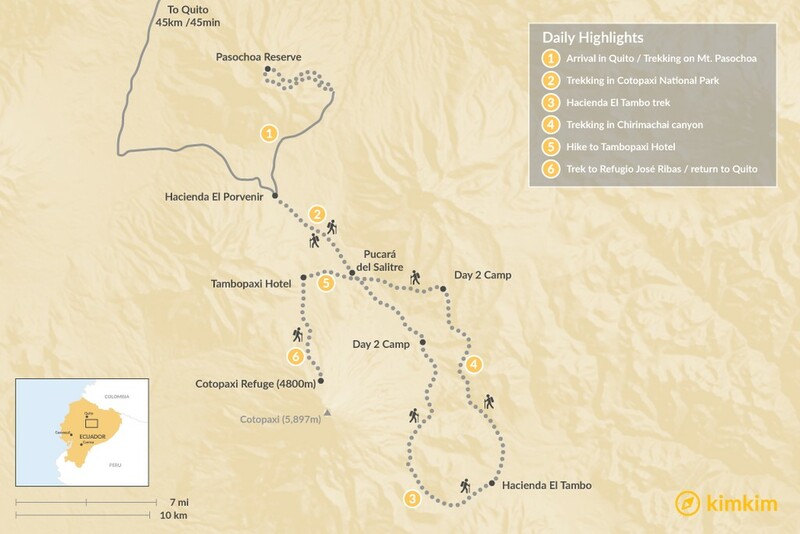 The average elevation of the 7-hour hike is 3850 m. We will overnight at Tambopaxi Hotel. 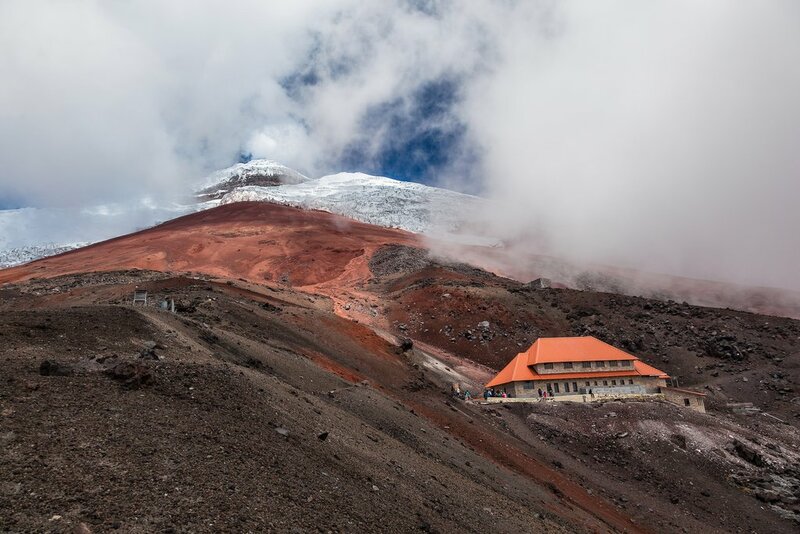 Refugio José Ribas, situated at 15,744 ft.
Today we will hike to Cotopaxi Refuge at 15,744 ft (4800m). The walk will take 5-6 hours and culminate at the climbing hut (Refugio José Ribas), where we can feel the sheer power of the immense volcano (which has a total height of 19,347 ft) at close quarters. This long and steep climb will have an average altitude of 4200 m and a vertical increase of 1067 m from the camp to the refuge. In total, the walk will cover 5.3 miles. Following the hike, a vehicle will take us back to Hacienda El Porvenir, where we will be served a well-earned tasty lunch to round off this great trek. In the afternoon we'll return to Quito.